The Kajaki Dam is located in this district. 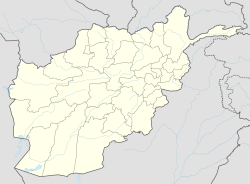 Kajaki is a district in the Northeast of Helmand Province, Afghanistan. Its population is by a vast majority Pashtun, and stood at 69,300 in 2012. The district centre is the village of Kajaki. Route 611 passes through the district to the district center. ^ a b "Settled Population of Helmand Province" (PDF). Central Statistics Organization. Retrieved 9 December 2015. Wikimedia Commons has media related to Kajaki District.